If I had been told there was a band made up of members of Abigail Williams, Aborted and System Divide I don't think I ever guessed that the beer fuelled magic of Bro Jovi would result. Yet here we are, with a party record that captures the heart with gritty rhythms and chunky vocal lines. These guys are writing music that is fun and engaging, guaranteed to fuel your next kegger. There is a certain manic dedication to the music that makes Bro Jovi's debut Songs to Crush Beers To Vol. 1 strangely addictive. The crunchy vocals and the epic guitar tone immediately reach out and fill me up with the urge to party. Bro Jovi understand how to get ripped in the least classy, most violent and destructive way possible. 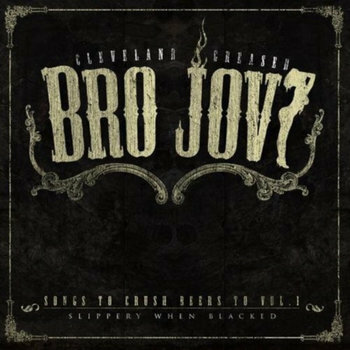 In other words, Bro Jovi may very well be this generations Municipal Waste, only now groovier and more Motorhead inspired. If they aren't, we stil have an awesome new band, who prove the cult of partying will never die.